208 seconds. After a collision with a flock of geese disabled both engines on the plane he was piloting, Captain Chesley "Sully" Sullenberger had fewer than 4 minutes to get the plane on the ground. Would he turn back to La Guardia, head for Teterboro 7 miles away, or do something else? 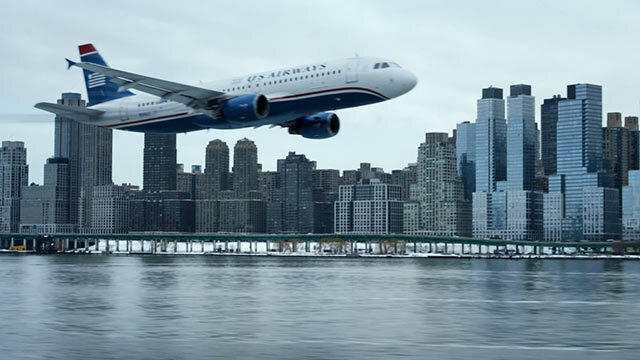 Feeling that the dense population on the ground would be at risk if he headed for either airport and failed to make it to the runway, Sully decided to land the plane on the Hudson River. Despite a few injuries, all 155 passengers and crew members survived the ordeal thanks to quick response times from authorities on the ground. There are elements to this story that are incredibly thought provoking - the imagery of a plane falling from the sky across the New York skyline, the question of whether Sully made the right decision in those 208 seconds, even if the outcome was positive. And the imagery of those 208 seconds are thrilling. We see one possible version of the plane crash in the film's opening moments, and then we return to the water landing in small recollections throughout the film, finally seeing the full scenario play out towards the film's end. With films constantly creeping up towards the 3 hour mark these days, I was relieved to hear that Sully only had a running time of 96 minutes. I'm typically in the less-is-more camp when it comes to movie running times, and in almost all instances it feels like movies could benefit from some additional trimming these days. So 96 minutes? Sign me up! Unfortunately even at 96 minutes, Sully feels like it packs a punch only about a third of the time. Like those 208 seconds have been stretched again, and again, and again, yielding something that is far too thin as a result. Tom Hanks is incredible as always (in his portrayal of another Captain! ), but we only need so many scenes of him painfully questioning his decision and stoically telling his wife (Laura Linney, who is in this movie for literally no reason at all) that he can't talk right now. Part of the problem is that the whole film revolves around a showdown between Sully and the U.S. National Transportation Safety Board. I can't say that I was there, but it sounds like the contention between the NTSB and Sully was largely inflated or even completely fabricated to create something resembling a villain in a story that, frankly, didn't really have one. The NTSB is painted as a greedy, cynical group who look at Sully with disdain for endangering the lives of the passengers by attempting an unsafe water landing when he could have come back to the runway. Motives like insurance payments and money are bantered about as the logic behind the investigation, though it doesn't seem like the place of the NTSB to care about the result of an insurance claim to begin with - if this was a report being issued by the actual insurer, then sure, I'd buy it. Because we all already know how the story ends - Sully is a hero! - it feels like a somewhat protracted affair to move from "The NTSB is mad" to "The NTSB isn't mad," and that's where the film spends the majority of those less-interesting 60 minutes. It also takes a stab at giving us some characterization of the passengers on the plane (we spend about 2 minutes with a group of 3 passengers that got separated because they couldn't sit together), but this attempt is so short-lived it doesn't really feel like it belongs in the film at all. Sully isn't a BAD movie, and it's certainly one of director Clint Eastwood's better efforts as of late. It's refreshing to rally around a group of people who became heroes by doing their jobs and doing them well, celebrating the aversion of a disaster, for once, rather than obsessing over gruesome details of another catastrophe. The riveting scenes of actions sprinkled throughout and the ever-so-solid Hanks make this worth catching on a lazy day, but it still feels like the concept should have been altered to meet the running time, or the running time should have been cut to match the concept.